North London is a bit of a vinous backwater. I moved out of Archway within months of the Theatre of Wine arriving to bring the area its first really good wine shop, and my new neighbourhood, East Finchley, has nothing to rival it, not even close. There’s a branch of Majestic halfway to Muswell Hill, and after that, nothing. Even the posh parts of north London don’t have much to shout about – a branch of Jeroboams in Hampstead; a shop called Bottle & Basket in Highgate village which remains defiantly unwebsited, while Kentish Town, Belsize Park, Golders Green and Hampstead Garden Suburb boast nothing more than the occasional branch of Nicolas or Threshers. It’s more or less a dead zone. So in the circumstances I was delighted to find signs of life in the Old White Lion, a humble pub next to East Finchley tube station who have taken to putting on wine tastings at absolutely no cost for regular customers and interested others. Each session has a theme – this Thursday’s, the last one before Christmas, is focused on fizz, but the one I went to was all about the “classics”. What this amounted to was six wines from classic old world regions – a Sancerre, a Chablis, a Bourgogne rouge, a Chianti, a Bordeaux and a Rioja – all of which were on the pub’s list. The tasting was led by a bloke from Liberty, importers of some very excellent wine, who did his job pretty well, knowledgeable enough to inform but still very much open to beginners’ opinions. The wines weren’t enormously exciting, but they were by and large decent representatives of their areas (though if I came from Burgundy I might have been a bit upset). The result was some interesting discussion on each of the two tables, and some people more engaged with wine and its variety of styles than they were before. I’ve been privileged to go to some pretty memorable wine tastings in recent months, but in many ways this was the best of all. 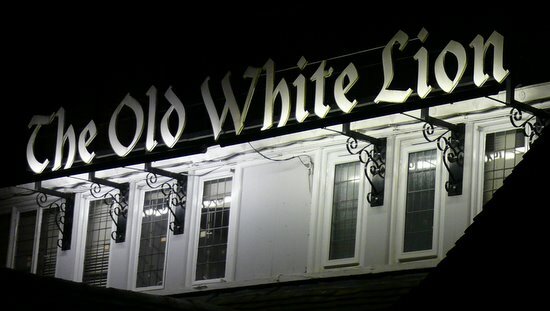 Because if the Old White Lion can enthuse my fellow East Finchleyites about the pleasures of the fermented grape, maybe one day we’ll finally get a decent wine shop of our own. And if you’re in the Old White Lion sometime and you fancy some wine, I’d recommend the Chianti. Soft, round, fruity and uncomplicated, it’ll go down well in any social occasion and at £18 a bottle it’s decently priced too.